Not science as such but . . .
Re: Not science as such but . . . If you can get the National Geographic channel on you TV, then here is a series that will be interesting to many of us. "Take a thrilling tour of one of the universe's most peculiar places-Earth- in a ten part event series One Strange Rock, airing Mondays at 9 EST starting March 26"
The March edition of NatGeo magazine has the teaser articles. The articles have interviews with NASA astronauts including Peggy Whitson who has spent 665 days in space. Gutsy woman. Additional articles are about what we learn from space.....complete with the typically elaborate maps and graphics. The series will not be suitable for creationists or flat earthers. Interedting, some sort of magnetic sense has been postulated for about as long as I have been interested in science I tuink. Even soecks of magnetite in the brain. Wonder if they will ever construct an encephalograph for bird brains to see if there is any sort of reaction to msgnetic fields? Coincidentally I have been reading a new book whose title is: The Spinning Magnet which is a reference to our earth and other cosmic features. Magnetism is another way of thinking of gravity and how it influences the whole world that we live in and the other worlds that we only see in the night sky.....and beyond. The earth's magnetic poles are in a constant state of displacement which appears to be in different orientations depending on where we are on the face of the planet. Our friend Bluenose, a navigator person, will know a lot about that problem for mariners. Might be a bit of a problem for birds too. Damned magnetite is scattered all over the place, on land and in the deep sea, which messes up compass bearings. Ah, how well I remember being taught about magnetic variation and deviation in "Navigation and Map Reading" in the Air Training Corps back in the 50s. That is a very unorthodox view of magnetism and gravity. In conventional physics we consider them to be completely unrelated forces. Is the author a physicist? Not kidding about the adjective; illustrious. There are some real thinkers here. That's one of the several reasons that I am so committed to this place. It sounds reasonable to me as an amateur in these matters, but there are other members far more qualified to make a judgement on the article. When I have a task I don't relish, my technique is to break it up into small steps, starting as early as possible. If the deadline is in a few days, I do a bit every day, and it feels easier than waiting until the end to work in a mad panic like some people I know. The same applies to studying for an exam or writing a thesis. Know this principle from RAF training and climbing/winrer mountain walking. Dr. Barry Bitman writing on laughter in the face of adversity says that change causes humans a lot of stress and the people who adapt are also the ones who succeed. So we can panic or get depressed; or choose to laugh and make the best of the challenging situation. He says humour gives a unique opening to move forward on a positive note. Laughter is even scientifically proven to reverse the negative biological effects of stress. 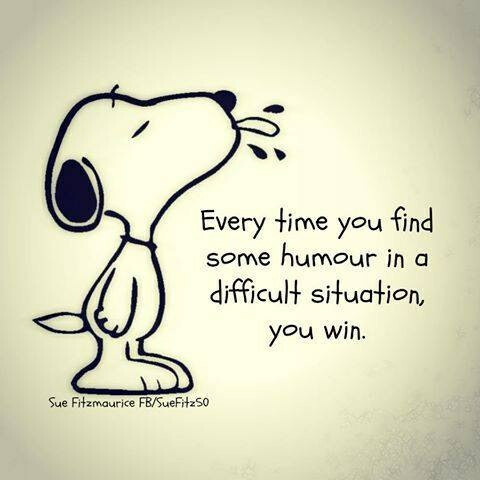 Choosing humour in the face of adversity brings us a much-needed sense of control, which facilitates healing. I don't have a formed opinion on this one. I didn't read any of the studies to see their methodology and how well they eliminated biases, such as were the subjects lead in any way to believe they would feel happier if they forced a smile? Did they see other people (or pictures of people) smiling? Did they smile in a brain scanner so that the neural correlates were examined and/or were they given questionnaires before and after smiling? Etc., etc. Substantial evidence exists for the effectiveness of humor as a coping mechanism. Studies involving combat veterans (Hendin & Haas, 1984), cancer patients (Carver, 1993), and surgical patients (Culver et al., 2002) have found that when humor is used to reduce the threatening nature of stressful situations, it is associated with resilience and the capacity to tolerate stress (Martin, 2003). I find stress a fascinating subject. There's this one book on stress that I've been dying to buy and read: Why Zebras Don't Get Ulcers by Stanford neuroscientist and professor Robert Sapolsky. Maybe a suggestion for the HAF Book Club? There are loads of interesting effects stress hormones have on memory, both positive and negative. Maybe one of these days I will write a wall of text on the subject. [...] And if you want more brain stamina, you need to systematically increase how long you make it work. I don't know if you'd get more "brain stamina" if you increase how long you focus on a topic you're studying, for instance, but maybe you'll cause it to use energy more efficiently with hours of practice. With a lot of practice and accumulated expertise the brain as a whole can become more specialised, and in some cases less regions are activated and therefore less energy is used. In other cases the area associated with learning a new skill gets larger, with more connections having been made, and uses more energy. Perceptions beats reality: Reduce the signals that make you think things are tiring and they won’t be as tiring. Make it a game instead of a chore. Caffeine gives you more energy, right? Wrong. Caffeine doesn’t give you more of anything. Wrong? If it has calories, even if few, it will also give you energy, even though that's not the main thing it does. Adenosine is a chemical in your body that tells your brain you’re tired. And caffeine blocks adenosine. The tired message never reaches the governor, and so the governor doesn’t hit the brakes. Caffeine works via that same principle we talked about above — it reduces perception of effort. Technically, caffeine blocks the site on an adenosine receptor in which the adenosine molecule binds, not adenosine itself. Therefore the molecule which signals that you're tired -- adenosine -- won't be able to activate the receptor. That's why we call caffeine an adenosine antagonist. Have to go now, but in general, I think the article is a bit too simplistic for my liking. . . .but in general, I think the article is a bit too simplistic for my liking. Says the neuroscientist-in-training who is used to all those esoteric jargon infested/peer reviewed/cited textbooks! For us lay mortals we only have pop-science and anecdote. My MI and subsequent life threatening things induced me to ask a, possibly life saving, question - will getting all stressed about such conditions improve their/my outcome? No, then don't stress out over them. One consultant still remembered, and mentioned some years later, that on coming round from the fourth defibfrillating shock from my implant in 24 hours I immediately cracked a joke. We are supposed to be quivering bundles of fear after such. But, maybe old Sneezer was right, "That which does not kill you can still tickle your funny bone." And I suppose I learned a very long time ago that there is no profit in giving way to fear. Unless you can run faster than it can . . . Nothing like a good review of the scientific literature! Saves a lot of time for people with little mental stamina, like me. I meant to say that it all seems too reductionist to me. The part about smiling makes you happier, for instance. Does it in all situations, for all personality types? If you're extremely competitive and force a smile after you come in second, will you feel happier? I don't know, but I tend to think you won't. Even if there are technical terms jargon words in them, those may seem like some alien language at first, but they may actually simplify entire concepts into a few words which helps understanding, not hinders it. At least I think so. There's a lot more to both of course, and a lot of scientific experiments and projects involve tinkering with this mechanism to confirm a hypothesis or not. It's a lot of fun. I think it's not worth stressing over things if you can help it. Fear is in the mind, and can be regulated by the mind/brain. I know the purpose of jargon and its almost essential use in textbooks - be half as long again in oure lay-tslk! But it can ge obscure and fonfusing, like "myocardial infarct" "instead of "death of heart muscle" of "heart attack" (the latter is not very specific, several conditions can "attsck" the heart). My favourite is "heart failure" - don't take it too literally, medically it is relative rather than absolute! But also shorter than "cardiac output function insufficiency" or even "systolic impairment" and, anyway, those are the result rather than the cause. But in some fields the jargon is overblown and, unnecesssrily, takes up more space than "lay speak" - managed to write an almost jargon free sociology paper ('cos I knew I did not need a pass in that) in my pre-uni college finals. Passed anyway. Often eonder if the medical profession chose Greek and Latin to keep their esoteric knowledge priviledged.